Playwright A.C.H. 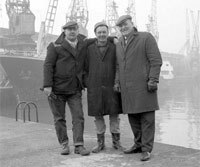 Smith recorded many interviews (with Andy Hay) from which to write the script of his play “Up The Feeder Down The ‘Mouth” produced at the Bristol Old Vic in September 1997 and revised and revived on the dockside at Bristol Industrial Museum in June 2001. We have reproduced some of those transcripts here, mostly accounts by several people of growing up on the dockside, and the excitement, danger and comradeship they experienced as children, both through their own encounters and those they had with the dockers. A family who lived on Prince Street – a woman, her brother, and her son – discussing the Lord Mayor’s Christmas fund , trips to Beeses tea gardens and life around the docks plus the air raids and sheltering during WW2. An interview with Bert (Dolly) Gray, his wife Renne Gray is present, conducted at his home discusses his experiences of working on the docks in Bristol including his childhood on the docks, various boats that ran aground at the docks and slum clearances. Bert talks of the place where his mother grew up in Hotwells and how it is now plus working with different loads as a docker. Mr Tanner on his memories of going on a pilot boat with his grandfather who was a harbour pilot in Bristol. He recalls cargo ships that used to come to the city harbour. Explains more about his grandfather’s job and how he operated. How he felt about the docks in general when seeing it as a boy growing up. Mrs Edna Tanner comments on the clearance of St Philips and St Annes when people were moved to Knowle West. They talk about the NUWM and the Board of Guardians. Mrs Tanner’s family had to apply to the Board for help. About the Board of Guardians and the grinding poverty of the time.